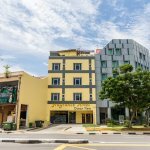 This hotel is convenient if you are attending to some events in NUS or the western part of Singapore. A pretty small hotel but adequate based on the price paid. Not recommended for families as they cater to short time booking of the rooms as well; by the hour rates. So I guess many couples visit this hotel for a â€œhappyâ€ time. Many food joints just round the corner and operates 24 hrs. Thus this is a plus point, just a 3 min walk. 7-11 is also close by. Staff at the reception, Syazwan Shahrom and Syahidah, left a good impression on us. They were patient, cheerful, and calm handling our enquiry and requests, even on a busy day where other customers awaited their turn. We want to say "Thank You", and wish them well in their career in the hospitality industry. Would love to say 2 of the staff at oceanview by the name of salamat and faizal or faisal was extra nice and caring. They gave us directions to places and we wanted to go via buses and the train. Because we were on a tight budget travel. And we didnt want to cab everywhere. They even shared stories of singapore and even told us where to get cheap food or even the nearest shopping center to go shopping and all. Would definitely come back to oceanview because of this 2 guys really cool people. Good job frangrance you need more people like them. Very inexpensive hotel. I found the reason when I got into the room: No closet, no clothes hanger, no fridge, no hand towel, shower head on the toilet wall, thin wall, crying girls in the evening :-(. But, silent after midnight, and convenience store (7d/w, 24h/d) and delicious restaurants are just beyond the corner :-). we had to stay at a nearby hotel whilst our home was being renovated. The twin sharing room (Rm 407) has no windows. The previous room assigned (501) has a windiw but was next to the generator/engine room. The light between the beds were out-of-order and maintenance took 5 days to replace the bulb and that was after I informed the reception 3 times. The toilet seat does not fit the seat. Generally, Reception and Housekeeping staff are courteous, friendly and helpful with the exception of a Malay lady who was on duty at the Reception on the morning of Sat 11 June, she behaves and looks like she is attending a wake. Two items in excellent working condition are the shower head and aircon.